The standard version of Exiland Backup (Exiland Backup Feature Comparison Chart) is offered for free at SharewareOnSale- the offer will be available for about 34 more hours. The giveaway is for the installer version so I won't take advantage of it. I have tested Exiland Backup Free several times and I like it- the program is very light, well-designed, robust and reliable. The free version is good enough for my needs. It seems it lacks support for volume shadow copy. I did some basic editing of the database entry, I think it needs some more redacting to meet the criteria of this site. I upvoted the program but it is still private. I think it deserves to become public since Exiland Backup Free is portable and stealth, easy to use (the GUI is clean and well-organized), feature-rich, light and clean (no ads, no nags beside the initial Upgrade screen on first run- I will test it more thoroughly and if and if there are other nags I will notify the community). I have some ideas for tiny enhancements and I may contact the developer. I have no idea what has been changed in the second 4.7 version. We are delighted to announce the release of the updated Exiland Backup version. The speed of scanning files over FTP, SFTP (SSH) was increased by 5-10 times in Standard / Professional editions. Any questions - write feel free not hesitating. I wish to try Exiland Backup Professional for 2 weeks. Could you sent me temporary license key and link to download Exiland Backup Professional? I immediately downgraded to version 4.7. After a while I will check again where there will be other nice surprises like time-bombs or nags. My initial enthusiasm about this program subsided so I will keep using the really free (no nags, no registration prompts) backup and synchronization tools I have. This registration is absolutely free of any charge. 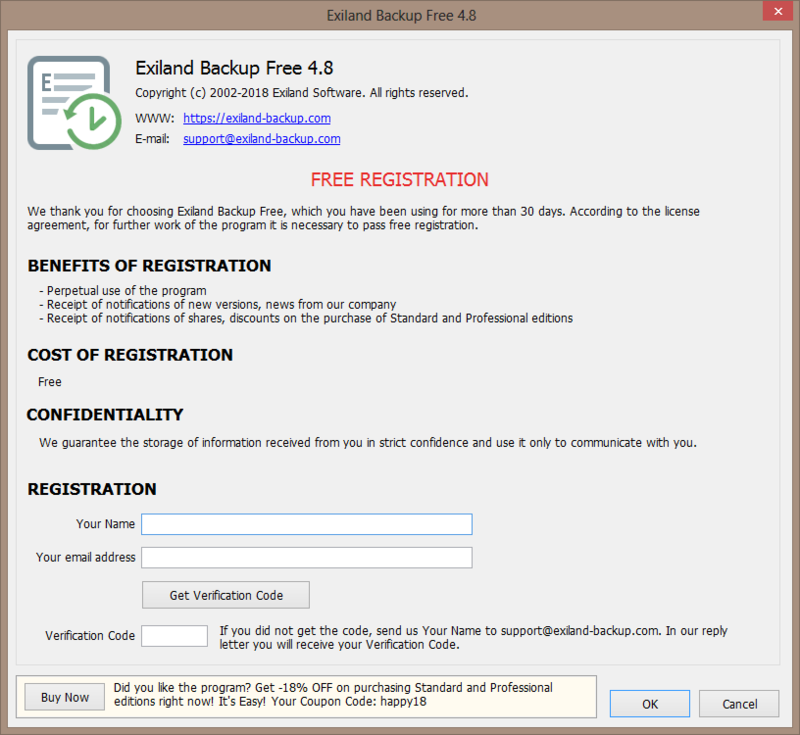 If the user is interested in Exiland Backup Free and uses it for a long time, he himself should be interested in receiving notifications of new versions and promotions. This is bug which we were already fixed. Thank you, Smaragdus! Please send us a request using the feedback form on program's website. Yes, we can provide you with the temporary license key. Sorry I didn't welcome you to the site earlier. This site tends to prefer programs that don't require registration. There are a few reasons for this including some concerns about what happens to registerware should the dev disappear. This has happened a lot over the years so it's a concern at least for me. There is however no policy against adding registerware to the database. A note has been added to the entry. I didn't see a nag prompt when I first launched the program. Does that show up in a day or a week? Or after a few launches? I am not going to discuss what users might be interested in. I am not interested in using registerware programs. Of course I might have used temporary mail services but I have no time to waste. After my preliminary tests of Exiland Backup Free I was impressed but after the release of registerware version 4.8 I do not plan to play with this program any more. The generous 18% discount didn't tempt me either. Since I do not promote registerware programs I will downvote the database entry. - Problem with exit prompt is solved. - Also, you can Ignore the registration by pressing "CTRL + I" on the registration form. Today I have placed the new compilation of Exiland Backup Free on program's website. Please download it, unpack and replace the program files. CTRL + I puts a smile on my face as no more nag registration screens afterwards, I was really distressed to feel like I wouldn't be using this backup gem anymore after it quickly became my favorite over similar ones due to shorter time to finish tasks. Also, you can Ignore the registration by pressing "CTRL + I" on the registration form. Help me out here: when does the registration screen appear and when do you pres CTRL+I to bypass it? I'd like to include that in the entry. Please include that in the entry. There are a few reasons for this including some concerns about what happens to registerware should the dev disappear. This has happened a lot over the years so it's a concern at least for me. I'm not saying registerware or trialware is a bad business model and should never be used, I'm just saying it's frustrating for those of us trying to promote freeware. Question 2 has been answered, thanks got that. Question 1 is still "when does the registration screen appear?" After a week? After launching 10x?" Last edited by webfork on Sun May 27, 2018 6:04 pm, edited 1 time in total.